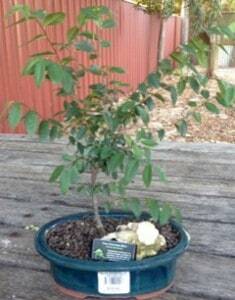 I was contacted by email just before Christmas by one of the subscribers on my mailing list, asking some questions and for a little help on a couple of trees he had recently purchased (one from Bunnings Warehouse), and it occurred to me that the information he was after would possibly benefit others as well, so with his permission I have decided to post our conversation, photos and other relevant information in this blog post for everyone to follow. I will paste the emails here and where appropriate I will answer questions using a different colored text so hopefully it will be easier to follow. 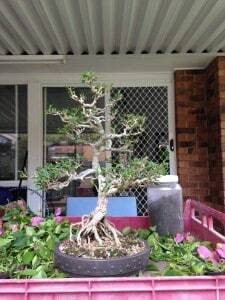 Thanks for the interest in my website www.balconybonsai.com.au, I hope not to disappoint and intend on making it bigger and better over time. The greatest challenge of running any website is knowing what people, like yourself, want to learn about, so thank you for your input and questions. I am particularly interested in Australian Natives (Paperbark) Melaleuca in particular. Do you have any experience with these? I too love Australian natives as bonsai and have experimented with several varieties over the years, Melaleuca is one that I never had a lot of success with (Yes I can kill bonsai too!) as they are very sensitive when it comes to root pruning etc. 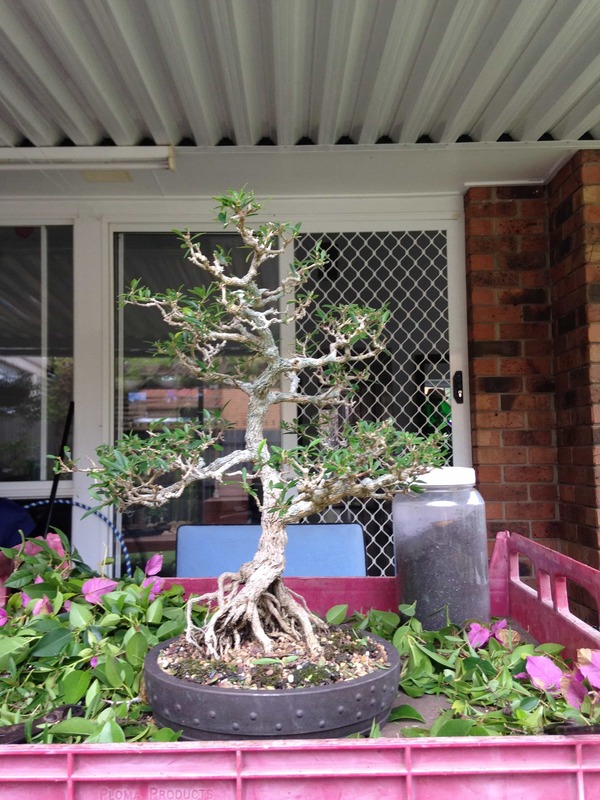 Varieties I have had success with are Callistemon (Bottle Brush), Lilly Pilly, and of course Port Jackson Fig, but there are many Australian varieties that could make awesome bonsai. 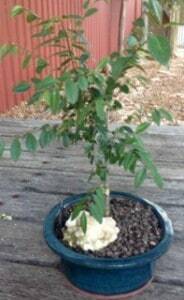 I am not very experienced (as you’ve predicted, my first bonsai died) and now I have a Chinese Elm (bought at Bunnings – hahaha, yes I know!) and a Nursery Ficus (completely untrained still in nursery pot). So the info on your site so far has been very informative, thank you. 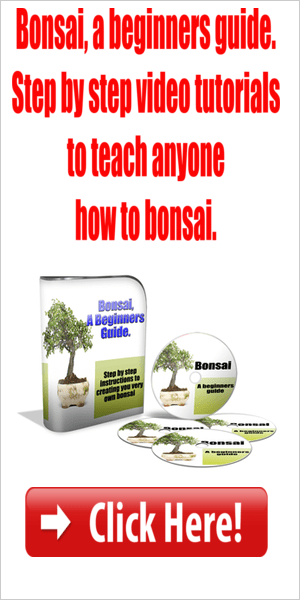 Your email is of great timing as I have been looking for a direction for the site, and more on Australian natives and information to help bonsai lovers who have similar questions to yours might be a great place to start in 2014. 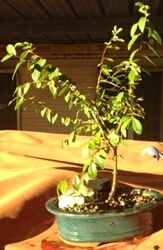 I would love to help you with your Chinese Elm (The Bunnings Tree!!) and your fig, and maybe we could document it on the website to help others at a similar level to yourself! I am flattered and scared poop-less about being a project on your site. Lol. Its very exciting but frightening at the same time! Truth be told, I will need all the help I can get so I have attached some pictures so you can have a look. 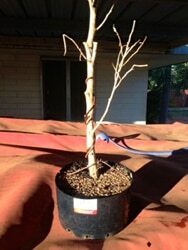 There are 4 of the Bunnings Elm (different sides) and only one of the Ficus (because its just alive). 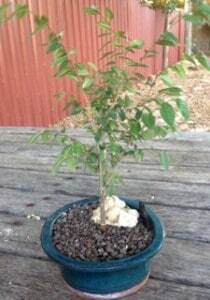 You are not alone when it comes to owning a bonsai purchased from Bunnings, I too once bought a clerodendron starter from my local Bunnings and it now takes pride of place among my collection. The Elm is responding very well to the weather change (from Perth to Port Headland) probably due to the increase in temperature, we are watering it twice a day so it won’t dry out. Good to hear it has coped with the move. 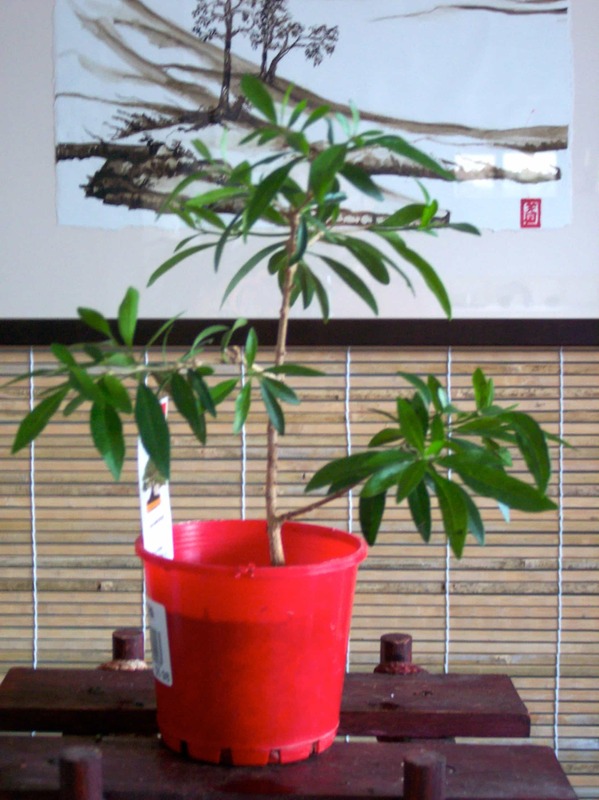 Don’t be afraid to place your tree (pot and all) in a shallow tray of water, especially if you are going out for the day and don’t want to worry about it drying out. The other solution is to put it in a much shadier spot during these extremely hot days and then just watering as needed. The leaves are getting darker and seem to be multiplying… Someone snipped out the centre and now it has several headers … Looks a bit of a mess and I’m not sure of what I want to do with it. I’m wanting to wire-it so that I get some movement (to the left) into the lower part of the trunk (if that means bending the trunk? ), then select a new header to form an informal upright. I have watched a huge number of bonsai styling videos on Youtube and would like to bring one of the lower branches around to the right of the side to fill in the open area with a pad. Then that just leaves the top mess… Your suggestions? It’s good to choose a style (Informal upright) to follow as this will help give you some direction. 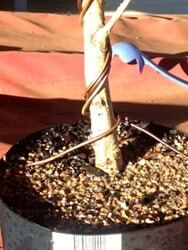 Getting movement into the trunk (Yes you have the terminology correct) is a good idea being careful at this time of year as your tree will be growing rapidly causing it to swell, and this may cause any wire to cut in leaving scarring before it has time to set. Don’t let this stop you, just be mindful of this and remove wire before it cuts in, you can always wire again a little looser if it needs more time. You want your first branch to eventually be the heaviest and around a third to a quarter of the way up the over all height of your finished tree, from the photos it looks like you have a couple of choices so choose one that best suits and remove any branches below that point. With the top of the tree choose one of the branches that you can use as a new leader ( an extension of the trunk upwards) and wire it to continue with the movement you have created by wiring the trunk ( a soft S shape), this will be trimmed down later as we get more structure to the tree. 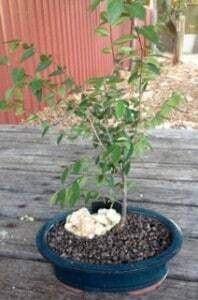 The Ficus was a throw-away from the nursery (commitment issues, lol) – it looks plucked because I read that this will reduce the size of the leaves as they come back. But its sooo tall! One thought is to chop it above the first side branch and make that the new top. I love the roots (not very clear) they radiate out freakishly symmetrically from the base of the tree … Its what I liked about it and probably why I paid money for it. Newbies! To me it looks like it has lost it’s leaves due to stress not necessarily “plucked” due to under/over watering or being root bound! A good start is to cut it back to it’s first branch as you suggest and wire that as its new leader, but maybe giving it a good feed of seasol and proper watering or transplanting it into a larger nursery pot before putting any further stress on it (like cutting the top out) and wait till shows positive signs of recovery before getting into it, that way whatever you remove from the top has a good chance of striking as a cutting and becoming another bonsai as well if it is healthy before removal. I have some Seasol like fish based fertiliser that I need to apply now (I haven’t done that as yet) to both. I want to work the ficus now (I’m really excited) but I’m worried that this is not the right time … You may be the sound of reason I need to not kill these two trees. Here’s hoping. Feeding both trees fortnightly during the growing season with seasol or other organic fertiliser (fish emulsion) is a good idea. That Should give you plenty to do for now, I look forward to the next installment. The ficus has suffered Newbeeitis – thats where an inexperienced person does too much at once without allowing it to recuperate … I fear it is dead, or dying. Had one small leave come back that has since shrivelled up and died. The stem has the tell-tale signs of dying off (wrinkly bark) BUT it hasn’t gone all the way to the bottom! I’m hoping, perhaps foolishly, that is will come back from somewhere near the base (funnily the part I wanted to keep ~ ref. discussion on trunk chop), so I have been feeling the soil trying NOT to overwater and giving it Seasol once a week … Wait and see I guess. Like you said – too much too soon! Sad to hear about the fig but yes it does sound like a case of “newbeeitis”. 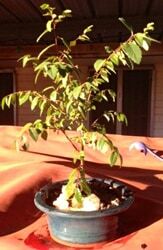 A couple of things to note: Fertilizing isn’t ideal on a sick tree and only once a fortnight if it is healthy. It’s best to reduce some of the foliage if root pruning so there is less foliage for the roots to have to feed as they are recovering. I have never heard of it the other way around as doing a complete defoliation means the tree has no way to produce food from the sun and any food stored in the roots will be limited if you also prune them! Pruning both is a good way to stress the tree severely and also a possible cause of the trees final demise! 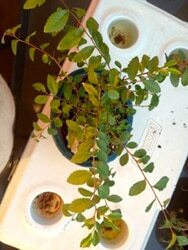 The Chinese Elm, I have not done anything to out of fear of Newbeeitis … It has received Seasol and regular daily watering. 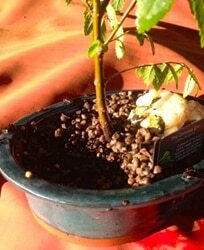 As the pot has very little soil in it, it would dry out much quicker. I’d like to get rid of the ‘decorate’ little rocks and perhaps pull it out and rework the soil? When I do the photos you’ll be able to advise me. It has had some growth on the tips of the branches which has matured (heart-warming) and despite the heat we’ve had seems to be doing really well! Because I really like this tree, I have not done any styling on it and I would like to discuss that option with you as well. I have discovered that having only a couple of trees causes the onset of Newbeeitis and so I have gone and bought myself a selection of new trees. If I spread the ‘Love’, then they might respond better AND live longer! I must confess, that I have (miss? )read that when you defoliate your tree it is a good time to reduce the roots, somewhat – which is what has contributed the downfall of the original Ficus I’m sure … Hope I get this into my thick skull quicker next time! I look forward to seeing how the elm is coming along, and hopefully your new trees will allow you to “spread the love” as you put it, and you can make something of them. 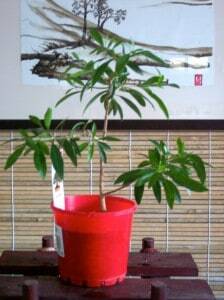 By what you’ve said, I’ve done all the wrong things at the same time – defoliated the tree, chopped the roots (hard) then used Seasol to “help it” recuperate! Anyway, I believe the wiring is not too shabby, even if the tree is well and truly deceased. Next is the Chinese Elm. Because of what I achieved with the Ficus (oh brother) I decided I would back right off and perhaps (unless you advise otherwise) just watch it for a year and learn its behaviour. To that end, I’ve noticed that in December it sprouted new shoots which could be because of the watering and Seasol (fortnightly) and, the new much warmer and sub-tropical weather at my home… Nothing has died off, all new shoots are darkening and are doing fine. I have some Seasol Powerfeed, but have not yet used it … Once bitten twice shy. Some pictures, again all four sides and one from top down. I have attempted to do as you suggested – take the pictures at eye level – see if they are good like this? I’m pretty sure we can say RIP to your fig, but the wiring does look promising. 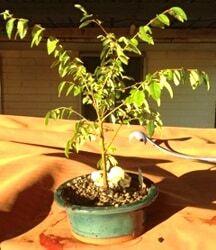 With the elm, I think the best idea is to wait till spring and re pot it in a larger container with good quality soil, then we can start to style it. to all my Bonsai Friend’s. 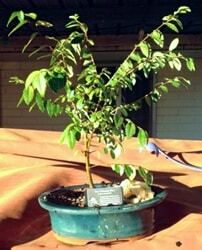 I have bought from a Nursery a Progmosa Tequila 4 y old! after one month I transferred this beautiful plant to a Bonsai Pot. and now after a light trim. It is growing beautiful, but nobody sofa is able to give me any info. on this Plant. Can you help. Totally enjoying this ‘journey of discovery’ that is unfurling here. I feel for the poor fig’s sad demise. I live in Brisbane and just last December 3 days prior to and after Xmas Day it was in the mid 40’s! Sadly, even sitting in shallow water and misting all the plants, I lost 4 trees *crying* I always whip my bonsais under the carport (which is my potting area, with comfy seating to pot and wire etc) when the temps get higher. Once the summer days really heat up – I turn into mother hen with my lot. My neighbours think I’m ever so slightly nuts and call my place “The Nursery” lol I can see you will have some lovely trees very soon :)) Keep up the brilliant work. Love the site, Peter.